The first stop on our food adventure around the world was Mexico. I knew I had to have that frozen Pomegranate and lime Margarita along with their marinated rib eye tacos, Yum! Oh, and of course, this tasty treat wouldn’t be complete without the sounds of the Mariachi band playing in the background. Next up South Korea. Still full from Mexico, and sipping my margarita, I wanted to make sure I could show you a few of the small bites from the other countries. I had to pace myself in order to try the samples that the other countries were offering. Africa, this is the one. Marinated beef tenderloin pieces with vegetables and mushrooms over grits. Sounds simple right, but the flavors in these dishes are out of this world. The ingredients and spices come together like it was a marriage made in heaven. We were all thirsty and stumbled upon a tea stand. I tried the mango ginger tea, WOW! We learned that this year’s event they were going to have food specifically from Florida. They offered a Zellwood Sweet Corn And Bacon Hash. Now comes my favorite thing to do, at the festival, it’s time for the food demos. Melissa and I split off from the rest of our party for some partying of our own. We head over to the Festival Center. This is the place where all the chefs do their food demos, book signings and all other kinds of cool stuff. So let me tell you what’s happening here. Starting at the top on the left is the entrance to the center, Then their vast wine display. Then you can see the set for the kitchen demos. There are also many unique displays. My dear friend Pamela Smith, with Spice Blends. has her display here. Pamela will be doing the moderating for the food demos all day. Here’s a picture of Pamela with a world-renowned pastry chef, discussing and teaching some pastry techniques. The picture on the right is a new chef on the scene in the U.S. Maria Isabel, but very well known in her home country of Puerto Rico. The highlight of my day was watching Chef Carla Hall do her thing at one of the demos. It’s amazing the connection she makes with her audience. She was doing a book signing after the demo. Melissa, bought me her new cookbook, Carla’s Comfort Foods. Needless to say, I hurried over to the standby line because the main line was sold out in minutes. I was lucky enough to be the first one in standby, so I had my finger crossed. I felt like I was meeting royalty. She was everything I knew she’d be, real, sweet and down to earth. She never left until she talked to everyone, even those of us in the standby line. Amazing, just awesome, and I even got a bit emotional. My daughter gave me a day I’ll never forget. Thank you so much, Melissa, I love you. After all of this, we were hungry again. We had to meet up Christine, Steve’s daughter for dinner. So the girls put their hats on and took this picture for posterity. How cute are they? Now it’s time to do some walking to reach our destination. Beautiful scenery, as we made over to Japan. It’s Melissa’s favorite restaurant. I would have loved to have shown some pictures of the beautiful and colorful dishes we had but, we were so hungry and tired that I completely forgot. Listen if you are ever in Orlando during the month of October, make this festival one of your stops while visiting. If you live here and have never been, you definitely want to put this on your list of things to do. This cake combines the taste of a pumpkin cheesecake with a moist and delicious cake. My new bundt pan gives an elegant touch that will have your friends saying WOW!. First is to butter and flour your pan really well. If you’ve been reading my blog you know that when it comes to making cakes, doing it from scratch is great, but can be super time-consuming. Today I’m using a box cake mix. There are really good ones available today and with a few special ingredients, you can make it your own. The French vanilla brand is my “go to” and base flavor for all my cakes. I can take this cake mix in any direction I want. The big advantage to a box cake mix is that all the ingredients are pre-measured out for you. I’m using 2 boxes for this recipe. You may not need to use all the batter that the two boxes yield, but 1 box is not enough for this bundt pan recipe. First the wet ingredients. I do one box at a time, it just never works out correctly when you combine the two boxes and double the ingredients. Combine the batter after making each box mix one at a time. Follow the wet ingredients according to the back of the box. In a large bowl, whisk together pure pumpkin puree, ricotta cheese, 1 tablespoon of a pure vanilla extract, and cream cheese emulsion (you can find this at any baking store). In another large mixing bowl, whisk together the eggs, water, and vegetable oil. Combine the bowl with the egg mixture together with the pumpkin ricotta mixture. Using a spatula, mix the wet ingredients together, until combined. Below is what the wet ingredients will look like once both mixtures have been combined. Add the dry cake mix and pumpkin spice blend (recipe for my pumpkin spice blend is at the bottom of this post), into a large mixing bowl, whisk those together. Add in a 1/3 of the dry ingredients, at a time, into the wet ingredients, giving the dry ingredients time to incorporate into the wet. Do this until all the dry has been incorporated into the wet. Do not overmix. For the second box cake mix DO NOT add the pumpkin puree or the pumpkin spice blend until the wet and dry ingredients have been combined. At this point, reserve 1/3 of the cake batter and set aside. 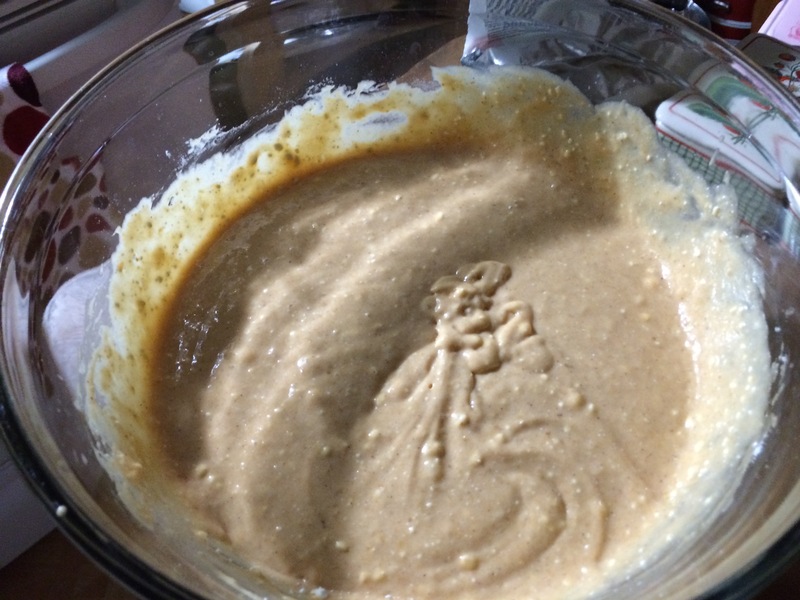 Next, add the pumpkin puree and pumpkin spice blend to the remaining cake batter, stirring until just combined. Again do not overmix. The bundt cake is going to have the flavor of a cheesecake running through the center. Fill 1/3 of the bottom of the prepared bundt pan with the pumpkin batter. Next, pour the reserved cheesecake flavored batter (that batter without the pumpkin flavoring), evenly around, on top, of the pumpkin batter. Finally, pour the remaining pumpkin batter evenly around, filling the bundt pan 2 inches from the top. You want to make sure that you don’t fill the pan all the way to the top, giving the batter a chance to rise. At this point, you want to have your oven set to 350 degrees following the baking instructions on the box. The baking process may vary. More batter is required for this cake than 1 box of batter. Keep checking the cake regularly after the box says it should be done. Use a cake tester or a long wooden skewer. When the cake tester comes out clean it’s done. This may take an extra 10-12 minutes for this pan. After the cake is done baking, place a large round plate over the top and invert the cake. You want that plate to be the one that cake remains on. Set the cake aside to cool completely in this position. This will make the later release of the bundt pan much easier. Next, move on to the cream cheese maple drizzle. In a mixing bowl, add softened cream cheese and powdered sugar. Stir together until combined. Slowly drizzle real maple syrup into the cream cheese mixture until it has the consistency of a glaze (a little more than a 1/4 cup). The glaze to fall off the spoon easily when you tilt the spoon. After the cake has completely cooled, carefully lift off the bundt pan. Using a spoon, drizzle as much or as little of the glaze letting it drip down all around the sides of the cake. There you have it, my Pumpkin Cheesecake Bundt Cake With A Cream Cheese Maple Drizzle. Prep the bundt pan with butter and flour. Shake any excess flour from the bundt pan, set aside. Fill 1/3 of the bottom of the prepared bundt pan with the pumpkin batter. Next, pour the reserved cheesecake flavored batter (that batter without the pumpkin flavoring), evenly around, on top, of the pumpkin batter. Finally, pour the remaining pumpkin batter evenly around, filling the bundt pan 2 inches from the top. Place bundt pan on top of a rimmed baking sheet. Place into the oven on the middle rack. Bake at 350-degrees F.
According to the box, bake for 30-35 minutes. The baking time will vary because of the amount of batter (almost 2 box cake mixes) that are used to fill this bundt pan. Allow for an extra baking time, around 10-12 minutes. Total bake time may reach 45-50 minutes. Keep checking the cake regularly after the box says it should be done. Use a cake tester or a long wooden skewer. When the cake tester comes out clean it’s done. Carefully remove the cake from the oven. Place a large round plate over the top and invert the cake. You want that plate to be the one the cake will remain on. Set the cake aside to cool completely in this position, at least 3 hours. This will make the later release of the bundt pan much easier. Next, move on to the cream cheese maple drizzle. In a mixing bowl, add softened cream cheese and powdered sugar. Stir together until combined. Slowly drizzle real maple syrup into the cream cheese mixture until it has the consistency of a glaze (a little more than a 1/4 cup may be needed). The glaze should fall off the end of the spoon easily when you tilt the spoon. When the temperature starts to drop here in the south, it takes me back to when I was a little girl living in New Jersey. The changing of the leaves, Halloween, and of course, Thanksgiving. The seasonal vegetables this time of year is so amazing, and so are all the decorations. I try not to go overboard with too much. I tend to think that less can be more when it comes to decorating your outdoor area. In just two weeks, Melissa’s coming home and I want her to feel that nothing’s changed. Mom’s still making sure the decorations are out in time for our time together will be just as special as when she was a little girl. Get ready EPCOT Food and Wine Festival, we’re coming for you!